So anyway, I set about gathering ingredients to make them but what I didn’t know was that I was about to strike upon THE CURE FOR PMS. Not. Even. Kidding. I can’t believe no one has trademarked this baby yet?! They should be sold right along side the Pamprin. A PMS treat. Lives might be saved. You think I kid? Try them and tell me if I’m wrong. These cookies are a bit of work, a little bit expensive but wildly delicious. I will never make another chocolate chip cookie recipe again. NOTE: These must be refrigerated for a minimum of 24 hours before you bake them. So plan accordingly. Like, know your cycle, plan accordingly. 1. Sift together the cake flour, bread flour, baking soda, baking powder, and salt into a medium sized bowl and set aside. 2. In the bowl of your mixer, cream together your butter and sugars until light and fluffy, about 3-5 minutes. Add in the eggs, one at a time, until combined, scraping down the bowl as needed. Add in the vanilla and mix. Gradually add in the dry ingredients, until just moistened. Fold in your chocolate until evenly added throughout the dough. Press plastic wrap against the dough, making sure it is completely covered, and refrigerate for at least 24 hours, or as long as 72 hours (Crepes of Wrath left hers for 36 hours. Madness I tell you. I had a reminder set for exactly 24 hours, plus they take a while to come to room temperature, so it was more like 26 hours before the baking actually began). 3. When you are ready to bake, bring the dough to room temperature so that you can scoop it out, and preheat your oven to 350 degrees F. Line and/or grease your baking sheets. Scoop your dough out onto the sheets. Do not press the dough down – let it stay the way it is. Sprinkle the cookies lightly with a bit of fleur de sel or sea salt. 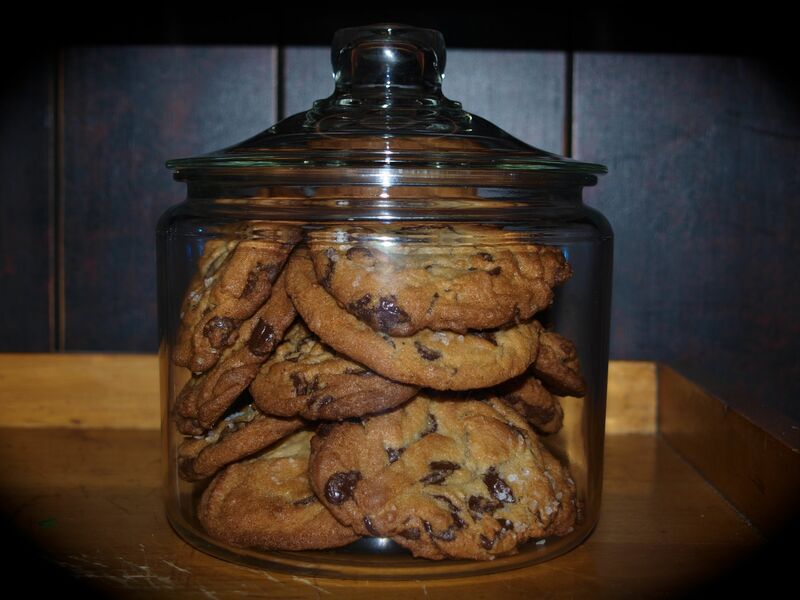 Bake 10-12 minutes for smaller cookies, or 18-20 minutes for larger cookies. 4. Allow the cookies to cool slightly on your baking sheet, then move them to another surface to cool completely. You can enjoy these warm, room temperature, or cold. Store in an air-tight container at room temperature for up to 3 days, or freeze for up to 2 months. Man, these look good. I think these may also be good for man-colds.